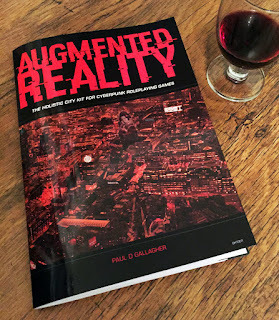 If you're STILL on the fence about grabbing yourself a printed copy of Augmented Reality: The Holistic City Kit For Cyberpunk Roleplaying Games from Lulu, here's a free shipping / 50% off ground shipping code, good for the next 3 days. Go grab the kit and see what other goodies they have available. Cannot be combined with other offers. Does not apply to eBooks or services. Ends February 12th at 23:59 (UK time). Just after I received mine! Typical. I've posted a review on RPG Geek. Hope it drives more custom to you. Thanks for the review, it's much appreciated. Could I post it on the blog? In regards to the drop grids, there's a free downloadable variant here: https://drive.google.com/file/d/0B-6yYlgff6_PcHh5UkI3bUY2cjA/view (they can be used to drop as well as roll-as-column. I hope you get a lot of use out of Augmented Reality. You're welcome (well deserved praise if I'm honest). I don't know RPG Geek's re-use policy but I have no objections. Thankyou for the download link. Very helpful. There's another code FWD15 which can be used as well to get 15% off at Lulu's cost.